The JW Marriott Miami is located in the heart of Brickell Miamis hot destination for dining, shopping, and nightlife and is located a short walk away from the citys newest shopping and entertainment destination, Brickell City Centre. The sophisticated business hotel boasts 296 guest rooms, the latest technology, and over 25,000 sq ft of flexible and recently redesigned meeting space. Guests are not far from all that Miami has to offer including the Perez Art Museum, Frost Science Museum, Adrienne Arsht Center, Port of Miami, South Beach, Coral Gables, Coconut Grove and Miami International Airport. 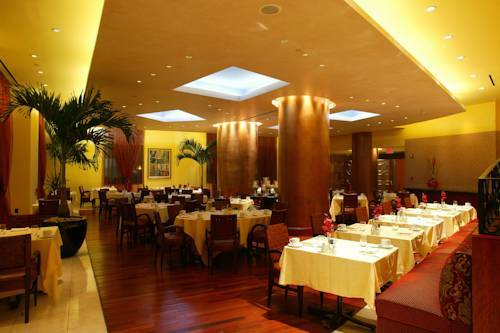 The first JW Marriott hotel outside of Washington, DC, the iconic property is complete with a British-styled pub on the lobby level, a casual al fresco restaurant overlooking Brickell Avenue for lunch or dinner and the elegant light-filled Isabelas for breakfast. Guests will also enjoy the stylish stainless steel pool on the 7th floor and unwind and relax at the full service Salus salon and spa. La Terraza Cafe & Bar: With its Plasma TV's and LED Screens tuned to popular sporting events & delicious casual fare served at lunch & dinner makes La Terraza the ideal place to unwind with friends and family. Drake's Bar: A power bar reminiscent of a classic British pub. The perfect place to toast the end of a business day. Features specialty drinks and appetizers.